Fresh parmesan (also known as Parmigiano Reggiano if you want to be fancy) livens up any pasta dish—be it freshly-made or store bought. I decided to go all the way and make a batch of fresh pasta—a dough made of flour and eggs that's rolled through a pasta machine until you've got thin sheets of dough. 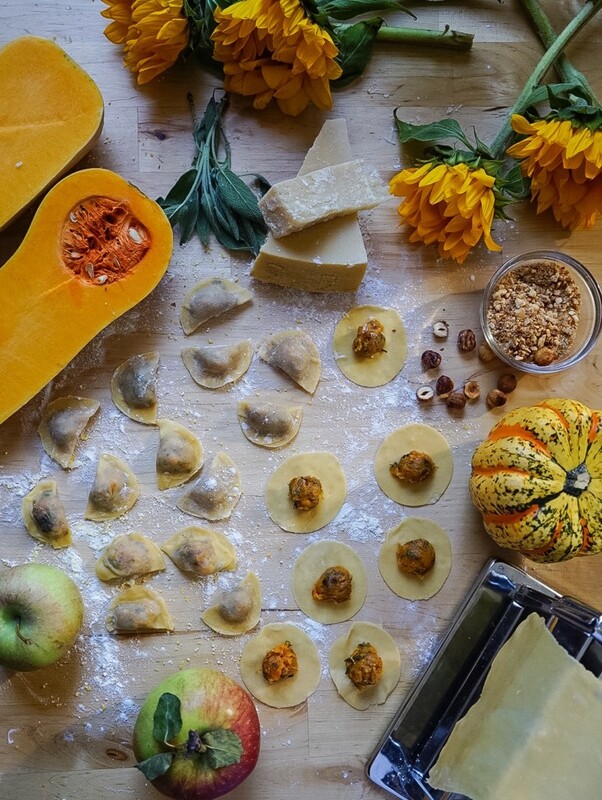 I cut rounds from the sheets and stuffed them with an autumnal blend of roasted butternut squash, ground hazelnuts, sage, homemade apple butter and of course, parmesan. I then made hand-shaped stuffed pasta crescents. This pillowy-soft homemade pasta deserves a rich and creamy sauce. I browned some butter in a skillet and added more chopped hazelnuts and shredded sage. I didn’t want the flavors in the sauce to overpower the delicate squash, but this aromatic sauce pairs great with the filling and accents the dish perfectly. Of course, a hearty grating of fresh parmesan is the perfect finish to this festive fall pasta. Parmesan has the perfect flavor to bring this dish together—and don’t skimp on it—buy the good stuff and grate it yourself to maximize its flavor and freshness. The good stuff is the straight-from-Italia, just-sliced-from-a-giant-cheese-wheel Parmigiano Reggiano. Note: You don't need to be a pasta-making expert to make the recipe I'm sharing below. I've only made homemade pasta a handful of times. Having a machine to roll out the dough into super-thin sheets is most helpful. Also, don't have the wherewithal to make the pasta? Just make the sauce! 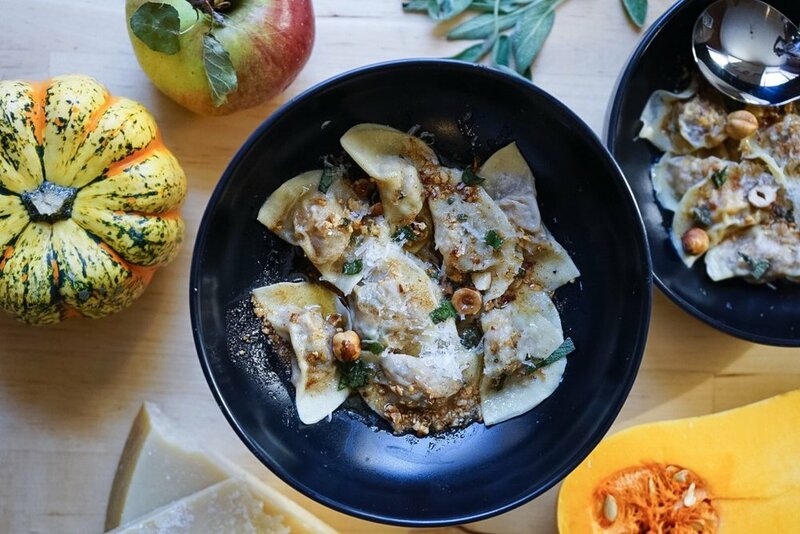 It's incredibly easy and will be the perfect way to top some store-bought butternut squash ravioli. And don't forget the parmesan! *Tired from all that pasta-making? A drizzle of good olive oil and some grated parmesan is an excellent no-fuss sauce for this dish. Preheat the oven to 400F. Peel, de-seed and chop the butternut squash to 1-inch pieces. Line a baking sheet with parchment paper. Arrange the squash in a single layer and drizzle with the three tablespoons of olive oil. Bake in the oven for about 1 hour, until the squash has some color and a fork pierces through easily. Remove from the oven, lightly sprinkle with salt, and set aside to cool while preparing the rest of the filling. In a food processor, pulse the hazelnuts until they are finely ground, but stop short of making a paste of them. Remove the nuts. Add the squash to the food processor and puree until creamy. Remove the pureed squash and place in a large bowl. Fold in the 3 tablespoons of the chopped nuts, grated parmesan, apple butter and chopped sage. Taste the filling to see if you should add any salt or pepper. Add salt and pepper to taste. Using a pasta machine, roll the dough to its thinnest setting. Place the strips of dough on a lightly-floured surface. Using a 3 and ½ inch round cutter, cut circles from the dough. Add a teaspoon of filling to each circle. Lightly brush the edge of the circle with water and fold in half to make a crescent shape. Remove any air bubbles and lightly press the edges together. Place each crescent-shaped pasta in a single layer on a floured pan. Repeat until all of the dough and filling have been used up. Boil a large pot of water with a few large dashes of salt. Add the pasta in small batches. Cook for about 3 minutes, then strain and place in serving bowls. Lastly, prepare the sauce. Add the butter to a a skillet and heat over medium. Once the butter is melted, add the chopped hazelnuts and sage and cook until it is brown and smells nutty. Be careful because the butter can burn easily! Spoon the browned butter over the pasta, and add a few more sprinkles of salt and some freshly grated parmesan. Serve immediately and let the creamy, fresh pasta bring a medley of fall flavors to your taste buds.